It was a simple question, not one we thought would elicit much discussion, “AP courses: Please share your kids’ experiences and what impact they had in college admissions and/or college credit/placement.” Our question was in response to a piece by our friend, the author and educator Jess Lahey, published on The New York Times Motherlode, entitled “To AP or Not to AP.” In the article, Lahey explained the many issues that go into a school deciding whether to offer Advanced Placement and International Baccalaureate courses and a student’s decision to enroll. AP courses were once the province of an elite cadre of students. Over time, this has fortunately changed and now the tests are offered in more than 30 subjects. Last year nearly 1.5 million students in the 11th and 12th grades took an AP exam. With so many high schoolers studying at this advanced level we thought it would be interesting and useful to gather the experiences of Grown and Flown parents and their students. What is the one thing every parent looks for in a school? Great classes and great teachers and most of our parents viewed AP classes as some of the best their teens had taken. AP teachers are highly qualified and attend summer institutes in order to prepare to teach these rigorous courses. The College Board offers online seminars and special sessions to help prepare teachers with the demanding curriculum of the AP. Many schools select their most capable, experienced teachers to offer the AP classes. The first thing every college freshman notices is that the educational process in college is very different from that of high school. College students are expected to do a great deal more self-directed work. There are fewer assessments so they must closely monitor their own progress (staying up with the reading, doing practice problems even when they are not assigned as homework…) with fewer external measures of performance. These new challenges are presented with far more difficult subjects and higher expectations. For many freshman this can be challenge, but for students who took AP courses, they had the opportunity to tackle college level material in a high school setting. They saw their teachers almost every day, they had regular homework due and frequent quizzes and tests to monitor their progress. Unlike college, in high school, teachers are watching individual student’s progress. While AP courses require more effort and time on the part of the student, the only additional cost to parents is the actual examination at $85 a test, and many students are eligible for fee exemptions. While not all colleges will allow students to directly substitute an AP course for a required college course, most schools will offer some credit depending on the student’s exam grade and the college’s policy. The AP site details the policies of each school, and most colleges accept the credits in one form or another. Some universities will allow students to skip introductory classes, others will allow AP credits to be substituted for requirements, while some will only count them as elective credit. Not all courses are treated the same and every school’s guidelines differ but parents we spoke to overwhelmingly agreed that AP courses were a cost-effective way to earn credits and save on tuition. Passing enough AP exams may allow students to graduate a semester or a year early, if this is one of their goals. Many students decide not to use their credits to graduate early but the credits earned through AP exams allow them to 1) take a slightly easier workload one semester because of illness, a job or a high level of involvement in a campus extracurricular 2) skip an introductory course and move on to a more advanced level in a subject 3) be exempted from a graduation requirement (e.g. foreign language) and instead take a course of greater interest to the student 4) gain some knowledge while still in high school as to whether college-level work in that particular subject is of continued interest 5) allow their students to add a minor or another major with no additional semesters or 6) to transfer colleges and still graduate on time, thus paying no additional tuition. One of the reasons students elect to take AP courses is to enhance their transcript for colleges, by showing their willingness to take on great intellectual challenges. , Christine VanDeVelde, to parse out this quandary. In a nutshell, here’s what colleges are looking for when it comes to AP’s. Hands down, when asked what’s more important — higher grades or tougher courses — every dean of admission we spoke to — over 170 of them — said they want students to opt for the challenge of tougher courses. But here’s what that means: Students should challenge themselves in the areas of their interests and strengths. Don’t just sign up for the most difficult classes available in every discipline, especially if that leaves you struggling. But don’t sign up for the easiest course load just to get straight A’s. Colleges look at students’ academic records “in context” — they want to see students challenging themselves within the available classes at their high school — and they never look at grades in isolation from courses. An A in Photography is not the same as an A in AP Calculus. Finally, students need to look to themselves to determine the workload they can handle while balancing personal interests, extracurricular activities and time with friends and family. And they shouldn’t forget to factor in how they handle stress. Lahey cited the work of Jay Mathews of the Washington Post as someone who has long studied both college admissions and AP courses. It is his judgement that three-five AP courses over the four years (though in most cases none are taken Freshman year) is the standard that selective colleges, defined either as a school who does not accept all of its applicants or the “top” 250 colleges, are looking for. By taking these courses the student is showing that he is both willing to challenge himself and take advantage of the educational opportunities on offer, something admissions committees hope is an indicator of the same behavior when the accepted student arrives on campus. One argument against taking some, or many AP classes, is the pressure brought on by the rigorous additional workload. High school kids are under enough pressure, why add to it? This is a double-edged sword. While the courses undoubtedly have a higher level of academic commitment they are designed for high school students and give them a taste of the demands of college. In one sense, they are “college classes light,” with the content of college and the structure of high school. While taking an AP course might create some stress, one could argue that the challenge might reduce stress later in college because students have already experienced academic challenges at the university level. Parents and teachers must watch this closely ensuring that students do not overcommit to their academic, and particularly, AP workload. But few high school students heading to college get by without some academic stress and to experience this while still at home under the watchful eye of parents and teachers, might just be a learning process in preparation for university. The College Board is looking closely the workload of the AP curriculum. Trevor Packer, the College Board’s vice president for Advanced Placement, says that the College Board agrees with the notion of high schools placing a limit on the number of AP classes in which a student is able to enroll. 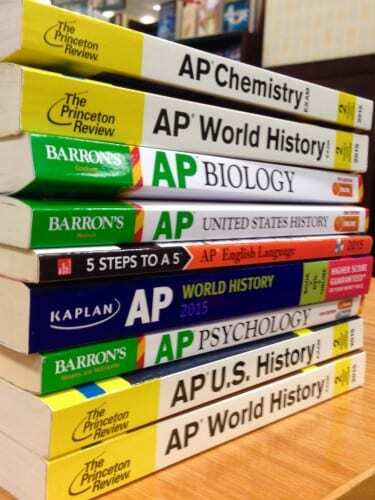 Recent revision of some of the AP courses, particularly Biology and US History with other science and social science classes to come, have been made in order to lower the level of memorization required, increase the critical thinking and hopefully reduce the time burden with a more streamlined curriculum. Yes. Some students dual enroll in a local college during their time in high school. Others attend schools offering the International Baccalaureate and forsake APs for this very rigorous program. A few high schools have done away with APs and thus the question does not arise. Students whose schools do not offer AP courses can take the courses online and the College Board recommends providers and high schools administer the test to as few as a single student. In our opinion, Mathews’, VanDeVelde’s and the overwhelming view of our parent-readers’ advice is sound. If a student is looking to apply to a college whose admissions has some level of selectivity, then AP courses will enhance that application as well as help prepare the student for college. But perhaps even more important, as so many of our parents related, deciding on your own at age 16, 17 or 18 to tackle a rigorous intellectual challenge and pursue that goal through a comprehensive exam is, in itself, a valuable learning experience.